It's a Broke Girl giveaway! Enter to receive a free autographed copy of "A Girl and Her Money: How to Have a Great Relationship Without Falling in Love," by Sharon Durling (aka Broke Girl, herself), pub. Thomas Nelson. Simply leave a comment below for your entry. Giveaway ends on Broke Girl's Birthday! --midnight, 25 July PDST. Winner must respond within 48 hours to our email to claim the prize. Will be mailed via U.S. Postal service to addresses in USA or Canada only. Winner selected by true randomness. Autograph to be made per your specifications. Do unsettling emotions surface when you pull bills from your mailbox? Do you fantasize about how great your life would be if you had or made more money? Does that row of numbers in your banking statements make you nauseated? Do you indulge in shopping sprees that leave you exhilarated but broke? Millions of women experience these conflicting feelings about money. 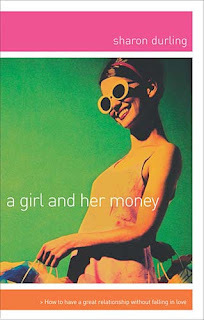 A Girl and Her Money is for women like us, by financial expert and veteran shopper Sharon Durling who, like a beset friend, shares empathy and an encouraging, liberating message: You deserve a happy, healthy and fulfilling relationship with money! About the author, aka Broke Girl: Sharon Durling was vice president at a global financial services firm. She was a stock, bond futures and options broker. She has an MBA from the Kellogg Graduate School of Management at Northwestern University. She lives, banks and shops in Chicago. Sounds like a very interesting book, would love a signed copy! Sounds really interesting...I'd like to read it! P.S. I am a broke girl. Sounds interesting! Count me in. I could really use this book. I suppose a guy could benefit from this book too! I also just subscribed via Google Reader. I could really use this book! Thanks for sponsoring the giveaway.